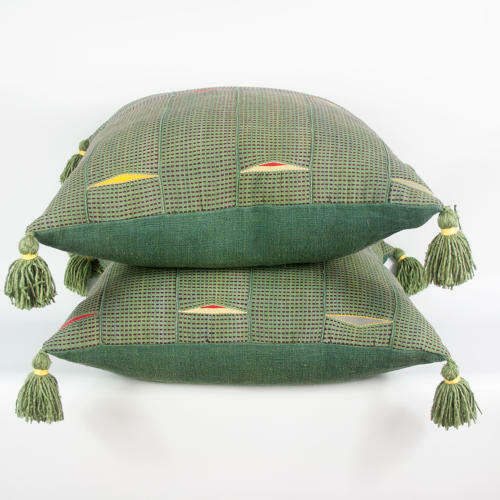 These cushions are made from a rare green Ewe cloth dating to the 1950s from Ghana. The green colour is very hard to find and the weave has a supplementary warp which is also rare. The main colours are green and burgundy. The corners are adorned with green banana silk tassels. There are 2 available and they have green dyed vintage hemp backs, zip closure and feather pads. If you are looking for a collection of cushions, I offer a concierge service whereby I will bring a car load of cushions for you to try on site.